I sea what you mean. But outside of dis, on the ground, an earthbender can still kill you easily. It is true that firebending and airbending can be activated everywhere tho. Earthbenders can kill you anywhere. any bender can kill you anywhere, as long as they bring the slightest amount of their element with them, or you bring it along, by bringing your body along. the red-lotus' old prison sites and their subsequent escapes show how little a decent bender needs to be a real threat. The difference between waterbenders and the rest of the benders, is that waterbenders usually find themselves in places with little to no water. Sure, earthbenders don't have earth at sea, but humans live on land most of the time. Firebending is the strongest. Everything about it has the potential to kill or give you 3rd degree burns. But Firebending seems to miss or be blocked alot in the show. When have you ever seen someone survive being hit by lightning( not counting when redirected or when Mako was weakened from being bloodbent)? Everyone fears combustion! Now imagine a Sozin tier firebender draining all the heat from your body. Or adding heat! Firebending is the strongest. Everything about it has the potential to kill or give you 3rd degree burns. But Firebending seems to miss or be blocked alot in the show. When have you ever seen someone survive being hit by lightning( not counting when redirected or when Mako was weakened from being bloodbent)? Everyone fears combustion! Now imagine a Sozin tier firebender draining all the heat from your body. Or adding heat! Right now that's only fanfiction. Though you might need that to rival waterbending top-tiers. Air and water are the most powerful, but earth and fire are the most dangerous. Earth has zero overpowered ablities(maybye lavabending but its slow and blocked) but it has the most versitle standard attacks IMO. It can have span large slow area attacks, to having quick strikes with standard metalbending attacks. It its offense and defense. Speed and power. Air is not really OP at all unless you are taught my Guru Laghima. Fire is also pretty OP since now everyone knows Lightning. It is pretty versitile as well since it doesn't need a source. It lacks defensive capablities. A standard Firebender vs standard Metalbender, a metalbender would probably win. Not only does earth block better, a sheet of steel would go right through a wall of air and gas. But insta-lightning and Combustion man are so OP. Water is the least versitile when it comes to standard waterbending. Without a large amount of water, the waterbender is useless. That is because nobody lives on water. But if you are skilled enough or a genetic freak...your are invincible. You are seriously underestimating metalbending, there is a reason why Avatar world probably has many times more platinum than our entire Solar System. Water bending restriction do not really seem to affect master waterbenders that much. Fire OP part would be combustion, not lightning. In fact I would say Lightning bending is where I would draw the line between powerful and OP abilities. Air is problematic due to inconsistant use of it, especially on user rather than enviroment around it. Bloodbending is a hax. I believe a comet Iroh and Ozai can find someway to exploit being bloodbended if Mako could. Are you kidding me? Lightning spam is basically a human machinegun. With Aang never learned redirection it would be Ba Sing Se all over again. We had to have Mako nerfed just to cover up the inconsistencies. No I'm not. I just explained its effectiveness. Its no way overpowered. Comet doesnt increase bloodbending resistance at all. Not like the AS. The show has demonstrated if youre being bloodbended for the first time...youre completely defenseless...unless your a stronger bloodbender. stronger bender. Not just bloodbender. I agree. If Mako as a Firebender can resist Amon's grip (if ever so slightly), a Comet-boosted Firebender should presumably have enough raw power to break free, like an Avatar in the Avatar State. I think that it is the control of one's chi that makes it able for someone to either bloodbend or resist it. Why else is it usually only during the full moon can a waterbender bloodbend? If it is just water, they should be able to control it easily and yet it is extremely rare and difficult to do so. If bloodbending was realistic...the moment a person's organs is grabbed, they would get a stroke and die instantly due to their cardio vascular system no longer pumping blood properly. I think the only chance any non-waterbender can stand up against a bloodbender if they use confusion and range to their advantage, or have a thick enough armor(that covers whole body) to prevent getting their organs grabbed. Comet boost < Avatar state. 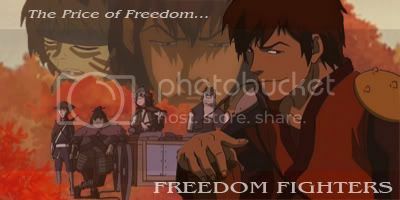 Also, Mako who was stated to be one of the more talented benders...was only for an instance able to resist bloodbending. Didnt stop him from being ragdolled a second time...totally helpless when Amon became a little more serious. Of course people are forgeting my original point. If Ozai/Iroh have the Comet, than Tarrlok and Noatak get the full moon...who are the more powerful bending brothers then? The question is how did Mako resist? -Amon was trying hard enough? -Willpower pushed the Chi against the water like a stronger waterbender pushes the water against the blood? -The lightning charge controlled the plasma which is 55 percent of blood? He just stripped the Avatar of her bending...its very possible he lowered his guard since he defeated the person representing ultimate bending power. Ask yourselves this: Did Mako resist a second time? Kinda, Amon had to slam him into a series of walls in order to subdue him rather than cause the same effect by just injuring him internally. Assuming bending strength is what allows people to resist bloodbending, Ozai and Iroh with the Comet would shrug off Amon and Tarrlok as easily as Avatar State Aang did. Ozai and Iroh with the Comet were probably just as impressive as Avatar State Aang. Cant see the pictures on my phone but AS Aang would soundly defeat either Comet Iroh or Comet Ozai (proven in the show). The only way Ozai can defeat the Blood Family is he snipes them from a distance like Combustion man ( with his lightning of course) and use his jet propulsion to stay away from average combat ranges. I never said Comet Ozai or Iroh would beat AS Aang. I'm not stupid. But in terms of firebending displays, Ozai and Iroh displayed power on par with AS Aang. And if the AS>>>bloodbending, then Comet>>bloodbending. Basically, an Avatar in the Avatar State (no Comet) would have comparable power to a firebender powered by the Comet. And honestly, the Comet boost is probably even stronger than an Avatar State boost. Korra in the Avatar State couldn't use jet propulsion on par with Ozai w/ the Comet, for example. We have no idea how Yakone would preform vs. Aang if he had a large ocean and the full moon. He may be going as fast as Ozai with a enormous watersprout. I'm not saying he would beat Aang, but saying AS instantly defeats a waterbender that caliber easier than Ozai is an overstatement. Cancelling out bloodbending and running from the AS are different equations. I never said Comet Ozai or Iroh would beat AS Aang. I'm not stupid. AS Aang's firebending is STILL stronger than even Comet Ozai's firebending. However AS Aang is also bending 3 other elements at the same time...while showing up Ozai's firebending. So Aangs AS is him channelling enough power to top-tier bend FOUR elements at the same time, WITH the knowledge of multitudes of previous top-tier waterbender lives, PLUS Raava...to mute telepathic bloodbending...no way will comet boost firebending do the same, "as easily" if it even can.